Antacids neutralize stomach acid, though depending on brand and type they differ greatly in their reaction time and neutralizing capacity. Veterinarians sometimes use antacids to prevent and treat dog stomach disorders and to lower high phosphorous levels in animals with kidney failure. 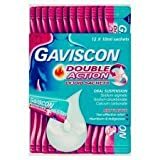 Gaviscon etc. are antacids that belongs to the class of antacids called H2 blockers. H2 blockers are so called because they affect a hormone called histamine in the body. H2-blockers work by inhibiting the action of histamine on stomach cells, thus reducing stomach acid production. Aluminum; magnesium; alginate antacids are available in chewable tablets and as liquids.